A friend of mine was in Paris a few months ago. She brought back some images of the Eiffel Tower in different lights and from different angles. I like the point of view captured here in particular. I almost feel dizzy from tilting my head back as I imagine taking in this view with my own eyes. 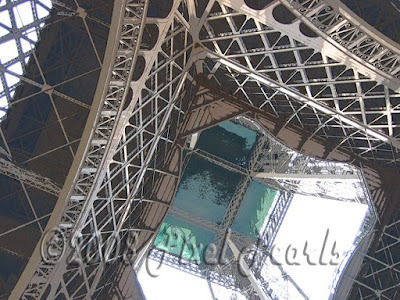 It is an image that shows off the lines of construction, the symmetry and towering achievement of this Paris landmark. I dug for color in this image and downplayed any distracting details that might get in the way of appreciating the delicate lacelike grid of support that makes up this structure. I think the finished pixograph highlights the giddy personal perspective and old fashioned wonder of sightseeing in Paris. On Nov. 1 we once again turned our clocks back one hour from daylight savings time to standard time. That always takes some getting used to. This week I am hungry at the wrong time, sleepy at the wrong time and am sad to see the darkness gathering before 5pm. With clocks on almost every electronic appliance these days the change requires a good bit of effort too. At times like this I appreciate the simplicity of an analog timepiece. One simple understandable motion changes the time recorded there and provides a sense of the space in between. This image was taken of a man's watch with the macro mode of my camera. 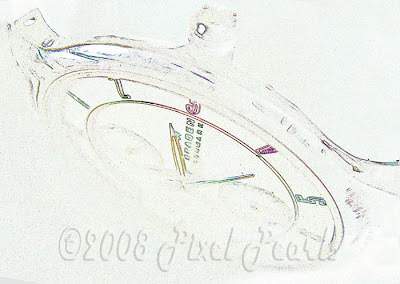 One side of the dial was captured in keen focus while the rest of the watch face was fuzzy. I wanted to enhance the simplicity of the image and highlight the tight focus. For that effect I enhanced the contrast, found the edges and boosted the saturation. The result is like a simple drawing of those wee hours when the time is changed as is the rhythm of our lives. Note: Do you wonder why we change our clocks backward and forward during the course of a year? Do you crave a simpler system? Check out StandardTime.com.